I received a copy of Madhur Jaffrey's newly published memoir of her childhood in India, Climbing the Mango Trees , just before I left for a long weekend visit to New York City. Perfect timing! Getting lost in a good book is my favorite way to pass the time on a cross-country flight. I started the book on my flight to New York, and finished it before we landed in San Francisco on my return flight. Jaffrey is the author of several cookbooks, including An Invitation to Indian Cooking and World Vegetarian , as well as an award-winning actress. Her memoir is an enchanting story of growing up in India living amongst her extended family of 40, and embracing the multiculturalism of her family -- Hindu, Muslim, and British and at a time and place when this was most uncommon. I have to admit that I'd never heard of daulat ki chaat before this, and Jaffrey's magical description left me wondering if it actually exists and is prepared as described. A little googling confirms that this is indeeed a magical, legendary and rare treat: "Legend has it that the dish is perfect only when the moon is out and beaming its silver light on the world." Aside from this story, I was not able to find any more detailed instructions or recipes that'd allow me to attempt to create this sweet treat at home. Searching through my cookbook collection didn't turn up anything either. Anyone have any suggestions for tracking down a recipe, or better yet, know if it's served anywhere in the Bay area or NYC? 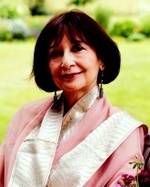 Madhur Jaffrey will be appearing this Saturday, October 14th at 2pm at Book Passage (Ferry Terminal Building, San Francisco). View a complete list of her upcoming appearances and events.